Plan Four C home has four bedrooms, 4.5 bathrooms, bonus room, den, two car garage and measure 4,376 square feet at Bella Fiore. Appointments include GE Monogram stainless steel appliances, upgraded front and backyard landscaping, central vacuum systems, granite countertops, deluxe security and upgraded cabinetry. The new Las Vegas home is $578,398. 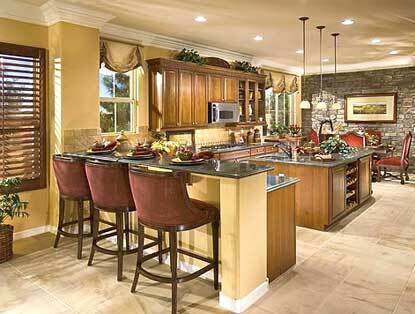 Bella Fiore development is located alongside The Falls Golf Club near the main entrance of Lake Las Vegas. The semi-custom new homes development by Pardee is surrounded by partial views of the Las Vegas Strip, golf course and scenic mountains. Prices for the new Lake Las Vegas homes are priced from the high $400,000s. They range from 2,307 to 4,376 square feet and include amenities such as interior courtyards with optional casita, offices and fireplaces. Luxury homes in Lake Las Vegas have special semi-custom home pricing.